Tumblr is a fascinating microblogging platform and the huge number of users is the most convincing evidence to make everyone take it into consideration. Despite of Tumblr popularity, the name and the story of its creators are less or more famous.David Karp is Tumblr founder and CEO; he is only 28 years old and he didn’t graduate the high school! Yeah, Karp dropped out the high school at the age of 15 years old. It’s unbelievable how he and his parents give up to everything in order to construct and market a microblogging platform. Fortunately, Tumblr is a huge success and he is one of the youngest famous entrepreneurs. 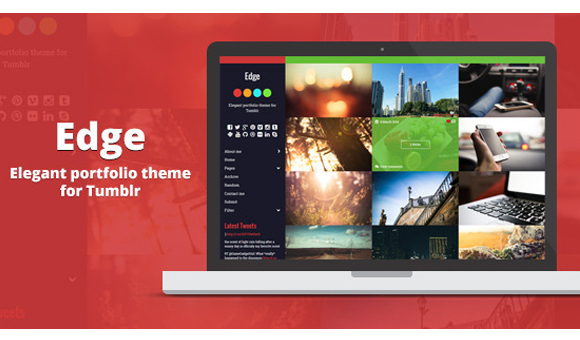 The web designers couldn’t stay farther from this network and created themes to enhance the Tumblr accounts. Of course, it was a good idea because lot of people wanted to customize their accounts. 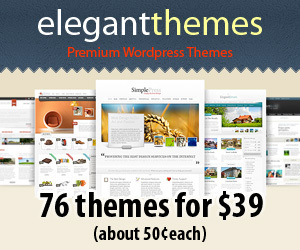 In present, more and more designers create impressive Tumblr themes and people buy these almost instantly. 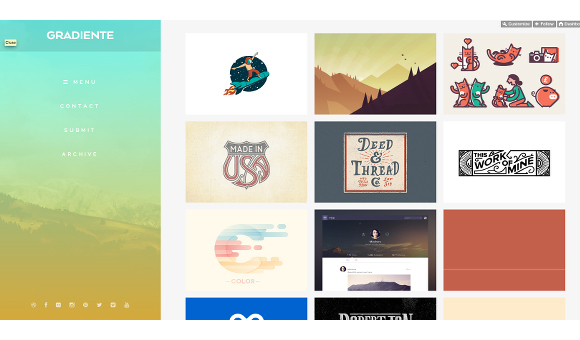 We previously showcased impressive Tumblr themes, but now it’s time for a fresh set of 20 wonderful ones. 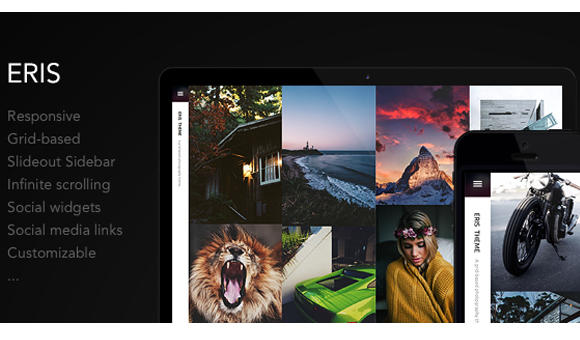 The collection is made up from fresh themes, so you may purchase one to enhance your Tumblr account! Many designers are against hamburger menu, but still none come with a better solution. Flud is a great responsive theme but it has a defect. I think that the hamburger menu from the right part of the header is too small when it’s rendered on desktop format. It’s a personal opinion and I am really curious to know your opinion about. Except this fact, the theme is well-designed and get the greatest mark at the cleanliness aspect. Tumblr main aim is the wide spreading of information using a concise, simple and intuitive platform. It’s said that an image is worth 100 words, so a Tumblr page sharing impressive images is the climax of this idea. Eris is a practical good looking example of this idea. Obviously, it’s suitable for photographers’ portfolio. 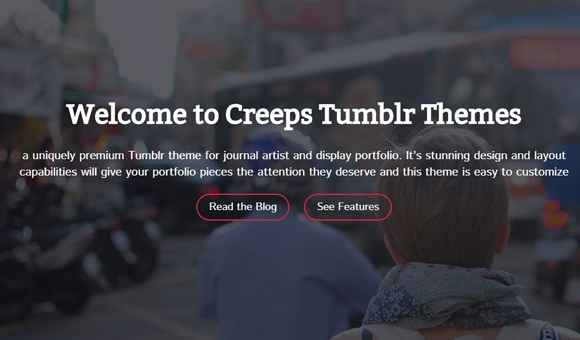 Creeps is a responsive and retina ready Tumblr theme. 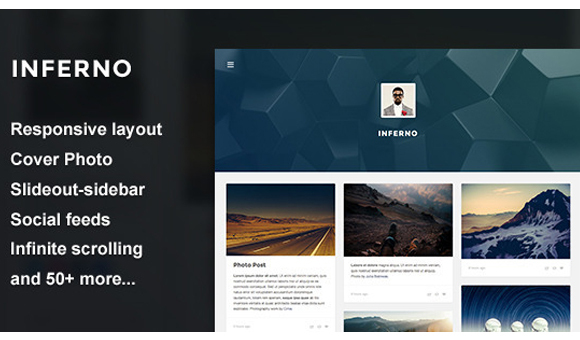 It supports all type of Tumblr posts and it has widgets that show the latest activities on social networks as Instagram and Flickr, Disqus comments, and the documentation is well written. At that, the theme is suitable for any kind of project so it deserves its place in this collection! 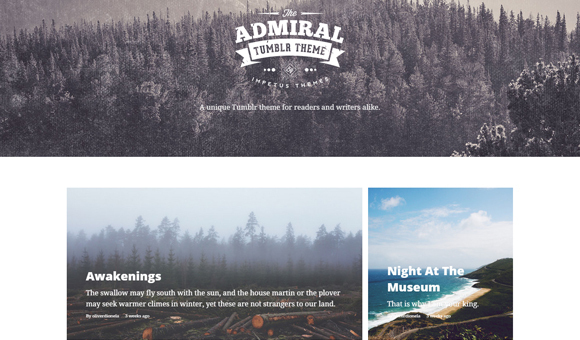 Admiral is a complex masonry layout based theme. It supports all types of Tumblr posts, but also the users are able to submit posts or ideas, the search form is awesome, off-canvas content and free future updates are just a part of the Admiral features and these must convince you to pay attention to it. 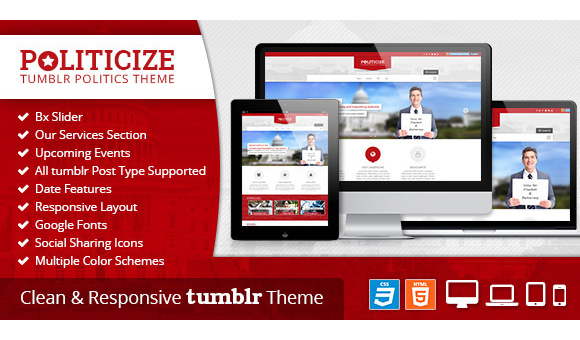 Politicize is another complex Tumblr theme that is looking almost similar to a WordPress one. It’s designed for politic parties or public personas and its structure is complex due to the fact that it must cover all the aspects specific to these projects. As example, this theme includes a donate button, a RSS feed, “team” and “About us” sections that are uncommon elements for Tumblr pages. 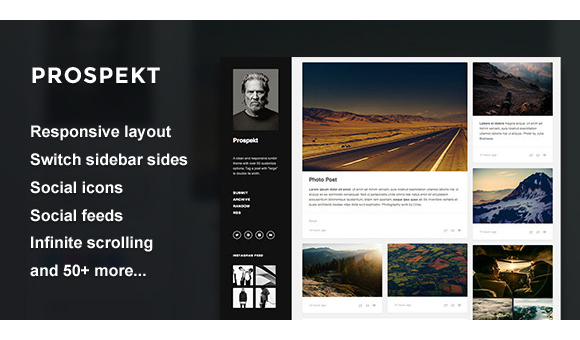 Prospekt is built using a unique Masonry layout. The innovative idea is the fact that the user may double the width of some posts in order to highlight the importance of these. 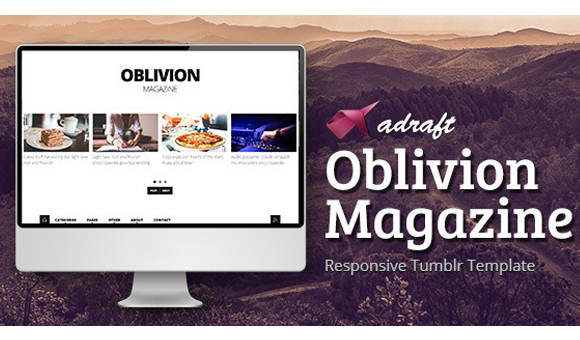 The theme is very customizable, but I like very much the current dark style that pleasantly emphasizes the content. Low poly backgrounds are very used this year and if you want a trendy theme, then Inferno may be a solution. Infinite scrolling, the full tailoring of the header, sidebar portrait and background, the multiple typography options are some interesting features of this quality theme. It was impossible not to add in this collection a minimalistic theme. 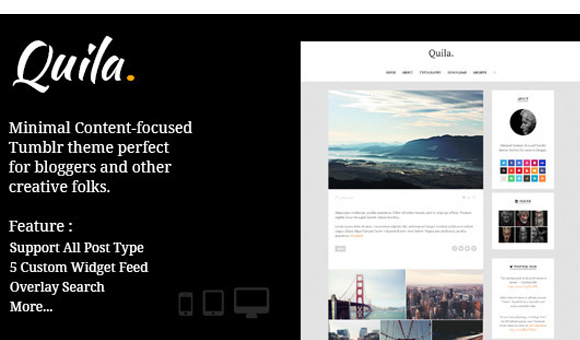 Quila is a black and white minimalistic theme that is very suitable for blogs because the design is specially created for the perfect reading experience. “Simplicity is the essence of happiness” is the slogan of the header and I really appreciate this idea. 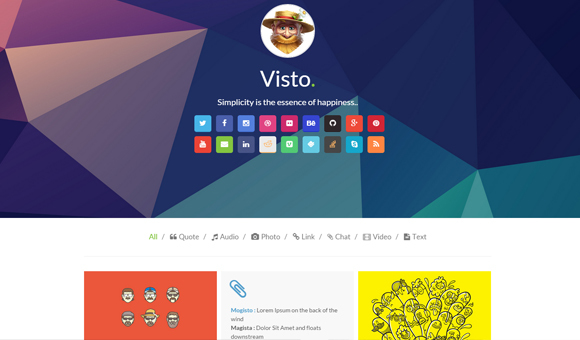 Visto is a theme suitable for blogging as the previous one, too. Altogether, the style of Visto is way more warm and happy. I think that this theme is a source of making everyone feel better and in addition to proper content the success is guaranteed. 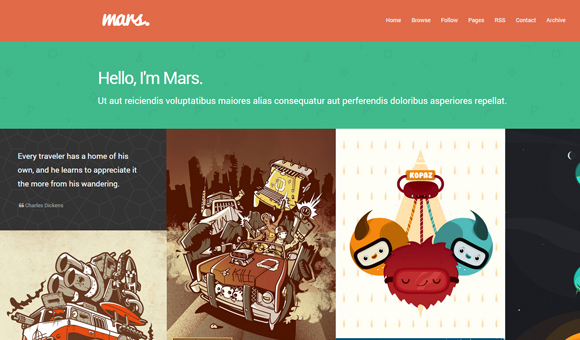 Mars is a Tumblr theme that is destined for portfolio projects. 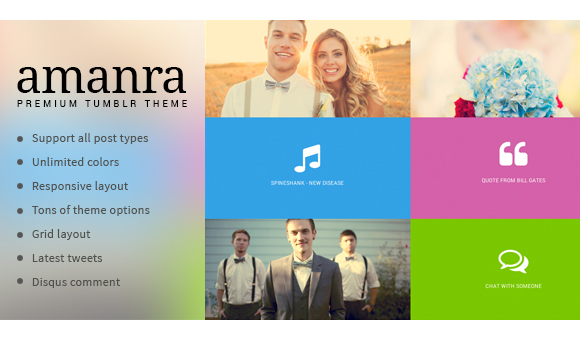 The style is very joyful and the colors are playing a big role in making this theme visually appealing. 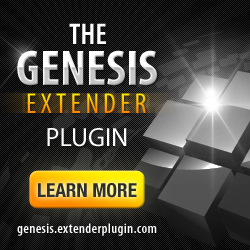 It’s responsive and retina ready, so the users will have the same enjoyable experience regardless the device used. 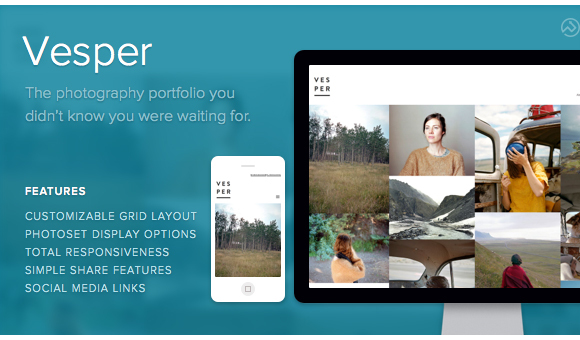 Vesper is the standard Tumblr theme for photographers. It is dedicated to exhibiting photos…nothing more or less. The theme is simple, but it doesn’t mean that it’s incomplete, it just let the photos specking for themselves. 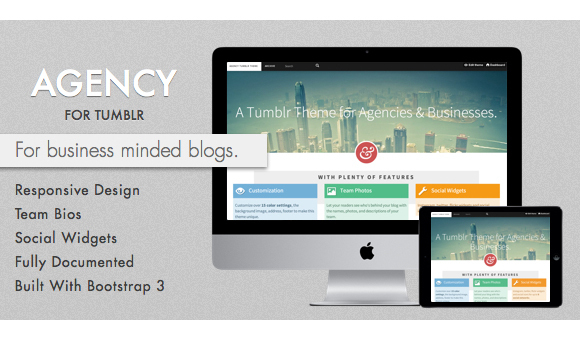 Agency is built using Bootstrap which isn’t something common, but the final result is really cool. Another unusual feature is the video background, but it looks cool, too. It’s a complex theme and it is aimed for business purposes. Colorfulness and cleanliness are somehow two opposite concepts and I thought until I saw this theme that their combination isn’t a good idea. Gradiente is a theme that made me to reconsider this idea. It’s fabulously how a theme may be full of colors, but in the same time very clean. It will be much better to check yourself to see this theme! Oblivion is the perfect choice for journalists. The posts may be featured and added into categories, the infinite carousel is main piece of the theme and the tag cloud is assumed from WordPress. It’s a very original theme and it will work as a magnet for users. 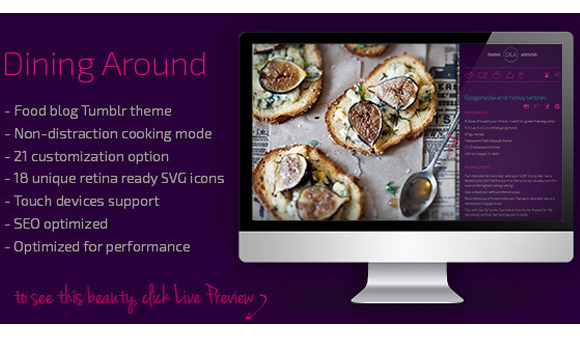 Warning: this theme isn’t suitable for blogs and it’s not recommended to check it if you are hungry. Just kidding…yeah, the theme isn’t suitable for any type of blogs because it supports only text posts; even the developers mentioned this fact but it’s the best theme for a food blog. It’s impossible not to remark the wonderful design and the care for details, i.e., the users have the possibility of printing the recipes. Edge is a very elegant and modern theme. The flat design based layout and the cool sliding effects immensely contribute to the modern look of the theme and surely attract the eyes of the readers. The theme is very customizable, so the ones that want to more powerful express their personality must be happy with this theme. Amanra is built on Isotope grid and it looks really great. 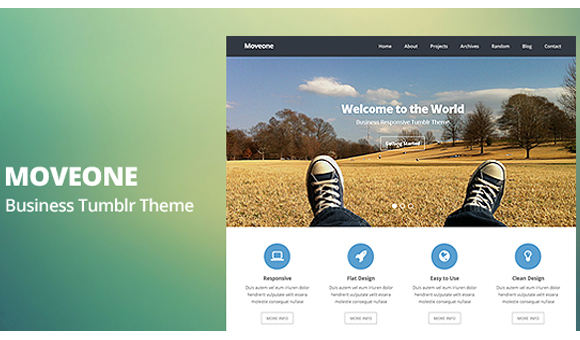 The beauty of colors and the boxed format of the posts are two big advantages of this theme. 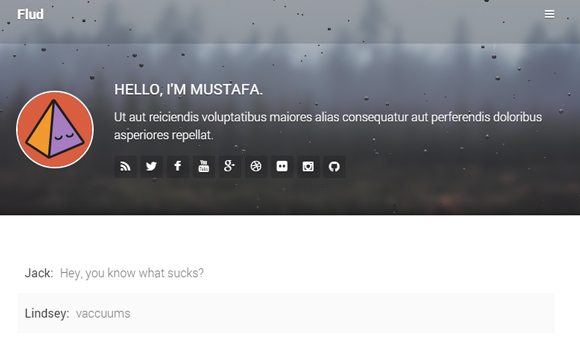 Of course, there are many other interesting features and I think that you should consider this theme as a reliable solution if you want to personalize your Tumblr presence. 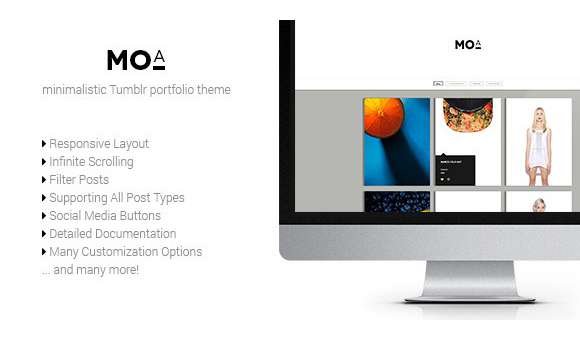 The ones that have a startup and want to have a standing apart Tumblr theme should visit Moveone. The flat design, the complex structure, the multitude of widgets and the truly awesome sliders will impress the potential clients. It’s not an exaggeration to state that this theme has the potential to increase the profits. 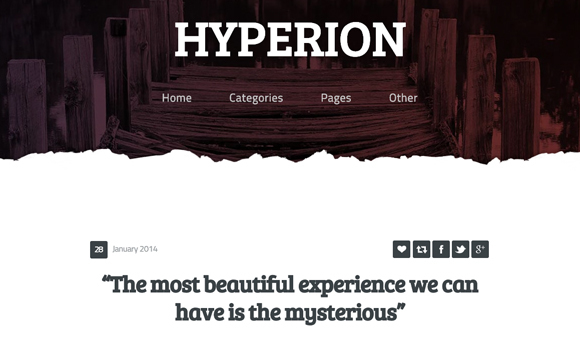 Hyperion is a very simple theme and its design makes the reading a real pleasure. The background is white while in the header are used darker color and in this way is assured a smart color balance. Deliberately, I let this theme at the end of this collection. The idea behind Tumblr is to build a simple, concise and interesting online presence. This theme is 100% a practical example of Tumblr mentality and I consider that it will became a hit in the Tumblr themes marketplace. I hope that these themes would be appreciated by the readers and it will be great to have a feedback from you. Do you have a Tumblr account?